Actuary professionals devote their entire careers working for insurance companies and concentrate on tiny statistics to predict the possibility of someone’s filing a claim. Consequently, they justify the enactment of higher premiums using certain criteria for people with higher risk. Some of the criteria are evident like your driving record while obtaining your car insurance or introducing your medical history for obtaining life and health insurance policies. However, few criteria might appear as surprising. Here are 7 bewildering rate enhancers. 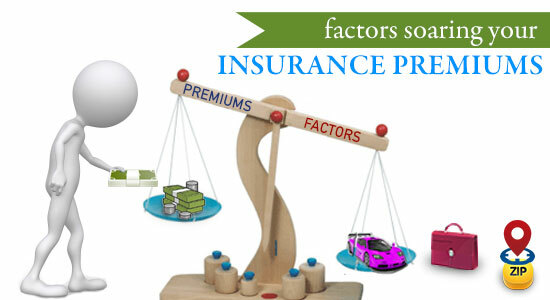 However, each insurance vendor has its own criteria. So it is always better to shop around before you buy anything. Using the Comprehensive Loss Underwriting Exchange (CLUE), insurance companies share information on homeowners’ claims for up to 7 long years. Once you apply for a home insurance, the insurance carrier looks at the claims history of your home. Suppose the house has a history of frequent water-damage claims. In such a case, you can expect that the carrier will boost your rate. You can expect that a Porsche 911 is definitely going to cost more to insure than a Chevrolet Camaro. Moreover, the more features your car has, the more it’s going to cost you in insurance. Suppose a 6-cylinder model is going to drain more than a 4-cylinder model. Auto insurance providers have discovered a connection between education and claims – fewer claims from people having greater education. Robert Hunter, former Texas insurance commissioner and director of insurance at the Consumer Federation of America (CFA), says, Each level of education you’ve completed may help lower your rates a bit. These days, obesity has appeared as the prime force behind all sort of medical issues that reduce your lifecycle. And therefore, some insurance providers have made their rules a bit firmer. Obesity can cause your life insurance premiums go high. Even if you are 6 feet tall and weigh more than 205lbs (with a BMI that crosses 27), you may be declined for lowest premiums. You never know but your height, weight and Body Mass Index (BMI) can make big differences to your insurance rates. Are you passionate about adventure sports like skydiving, hang-glide, car racing, riding ATVs or Dirt Bikes? If the answer is yes, then don’t expect to get the lowest life insurance rates. That’s why nowadays insurers ask you a lot of questions to assess the risks your hobbies might pose to your insurance policy. If you get health insurance through your work, then the rates depend might on the average risk of the group of employees. If the average age of the group is greater and the insurance provider faces lots of claims, your health insurance premiums will be higher. So it all depends on the average health and age of the group.